1) .ACCOUNTANT – The domain name is not only a new entrant for the new gTLD adds for January, but has managed to climb all the way to the top. .ACCOUNTANT was running at a special cost of $1.99 only. We will discuss this unexpected change further in the report. Did you know that .ACCOUNTANT globally has about 65,107 registered domains as of now? 3) .SPACE – Climbed from position 4 to 3 and continued at flat price of $1.69 for January as well. In case you didn’t know, Radix’s new gTLD has already hit a total of 213,163 domains globally. Although .GDN has been one of our top 15 adds, we have two new entrants for January; recently launched .VIP, and .FASHION. 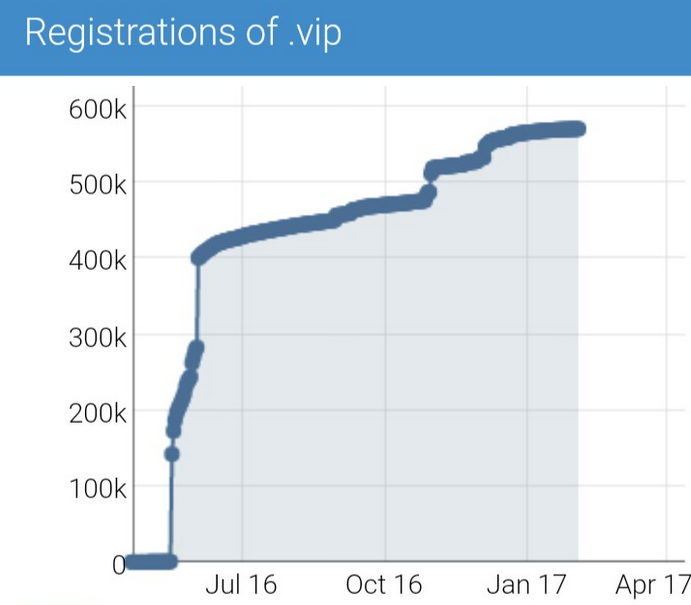 .VIP entered General Availability at 1600hrs UTC on 17 May 2016 and already has a total 569,142 (2.07%) registrations till date (globally). You can have a look at the graph below for more details. The perfect TLD for your customer’s multinational presence, .GLOBAL is running at a price of a mere $12.99 all February! Get . SHOP for a mere $6.99!